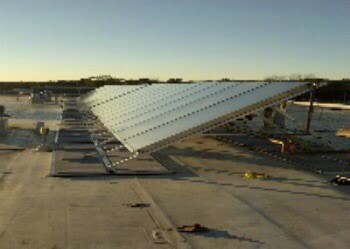 FOR IMMEDIATE RELEASE – March 2, 2012 – Binghamton, NY – SunMaxx Solar, a leading, vertically integrated manufacturer of solar thermal systems and components, is pleased to announce that the solar industry leader has launched a new Ballast Tray System. The SunMaxx Solar Ballast Tray System fits all major solar modules and provides a reliable and long-lasting method to mount flat plates, evacuated tubes, or photovoltaic collectors to a flat roof without any penetrations to the roofing membrane. The ballast trays distribute weight over a large surface area providing for a lower roof load per square foot. Aluminum and stainless steel components are rust resistant to provide years of maintenance-free service. EPDM rubber pads on the bottom of the system increase friction and prevent roof surface abrasion. The trays hold standard 8 x 16 x 1-7/8″ size blocks, which you can source locally. With these blocks in place in the ballast tray system, you can safely anchor your solar collectors without compromising the roofing membrane. One tray can hold 9 blocks weighing 15 lbs. each for a total of 147 lbs. per tray. Two SunMaxx TitanPower SU2 or 2.4 flat plate collectors can have up to 4 trays attached for a total of 588 lbs. between the two collectors. The low profile presents an aesthetically pleasing roof landscape. The simple design ensures quick, and therefore, low cost installation. The adaptable system works with flat plate, evacuated tube, and photovoltaic collectors. SunMaxx Solar Ballast Trays can be mounted on either or both sides of the rails, depending on the weight needed for the wind load. The ballast trays can accommodate custom designs for any size project. SunMaxx Solar’s Ballast Tray system is proudly made in the U.S.A. For more information, contact marketing@sunmaxxsolar.com.